David Kibbey, president of Vacaville, Calif. -based Sky High Bird Management, believes that effective bird control is a specialized skill. With more than two decades of pest and bird control experience under his belt, he decided to start his company with a bird focus only. That was four years ago, and with a minimum of advertising (a phone directory listing and a logo on his truck), he’s been kept busy ever since. In fact, his work with chain stores and restaurants has taken him to jobs in Washington, Colorado and Arizona. "I like that the work requires a lot of creativity," Kibbey adds. "I wanted to make it my main focus so I could concentrate on doing quality work. And I find now that many of my bird jobs consist of fixing other companies’ mistakes." Recent work on three of a large chain’s supermarkets is a perfect example, he says. By the time he got the call, the management was less than impressed with the work of previous companies. Pigeons were still roosting on the roofs, defecating down the front of the buildings. 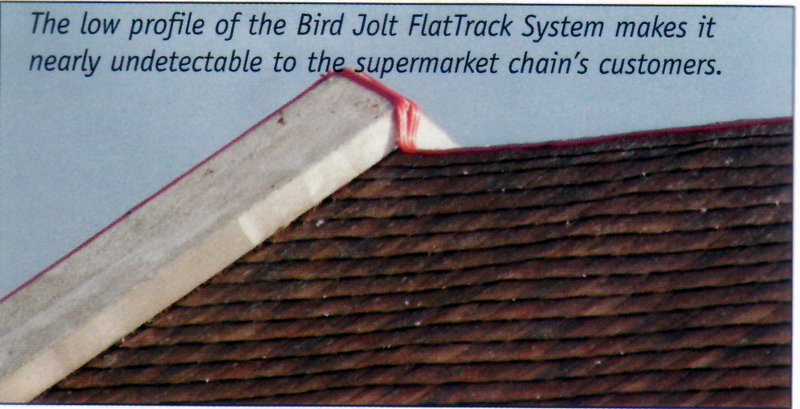 With the chain remodeling several of its stores and making aesthetics a priority, Kibbey immediately knew the product he wanted to use: Bird-B-Gone’s Bird Jolt Flat’Irack System. "The low profile of the system meant that it wouldn’t interfere with the building’s aesthetics," Kibbey explains. "Plus, the electric charge leaves more of a longer-lasting, psychological effect on the birds than other types of deterrents. They’re less likely to return." Each of the three stores took about three days and between 400 and 500 linear feet of track to complete. The first day consisted of inspection, cleanup and gluing down track onto the terra cotta roof, which featured a steep peak and gables. His three-person crew rented a crane to reach the higher areas. "We let the glue dry overnight, then the next day we used screws on the flat edges of the roof for the track," Kibbey says. Then, the hard-wiring process began. As the son of an electrician, Kibbey takes extra care in ensuring that the wire splicing is done correctly. He coats all of the exposed ends with liquid tape to prevent the possibility of corrosion or disconnection. "I’ve had really good luck with the hard-wired units," he says. "They’re waterproof and low-maintenance." While some birds landed the first day after the track was laid down (and uncharged), they were in for a surprise by the third day, when the system was up and running. While the mild electric shock does not hurt the birds, it does send the message that they are not wanted on the building. "This system will save the company the cost of constant cleanups," Kibbey concludes, adding that it fits in perfectly with his company motto: When aesthetics matter. It seems that not a day goes by without a news story about avian flu and the possible pandemic it may cause. Concerns about the potential threat are on the forefront of Americas mind, and it has taught us to be more conscious about the way disease is transmitted. “Indeed Avian Flu is a recent concern” says Bruce Donoho owner of Bird-B-Gone, Inc, “however I believe that there is a wide range of diseases currently carried by pest birds that pose a serious and more immediate threat to human health.” Pest birds can carry and transmit many common diseases in bacterial, fungal, and viral forms. This includes Histoplasmosis, Salmonella, Encephalitis, and Meningitis to name a few. While many people may associate this with pigeons, it is important to realize that most pest birds are carriers. Disease is a paramount concern of pest birds, and the adverse effects can reach into other areas of business as well such as maintenance costs and liability issues. Daily or weekly maintenance costs add up, and unsafe working conditions are never a desirable situation. Bird droppings and nesting materials can clog drains, and create standing water. Dried droppings around air conditioning units can be sucked into ventilation systems. On sidewalks and signs, cleanup may be required daily. Bird proofing is preventative investment that will save you time and money. It is important that all aspects of pest birds are explored. This way we can protect our employees, our buildings and merchandise, and ourselves. While transmission usually occurs by way of mosquitoes, mites and ticks, physical contact with bird droppings can also transmit diseases. Anywhere people come into contact with droppings is a potential spot for transmission. It is a good idea to alert your maintenance department of any affected areas. This way they can evaluate the problem, and actively work to solve it. The longer pest birds occupy and area, the harder it will be to get them to relocate. Some common areas birds favor are cooling towers, air conditioning units, parapet walls, rooftops, and inside warehouses. “Birds like rooftops and parapet walls because they provide a good lookout spot for food and predators” says Donoho of Bird-B-Gone. Air conditioning units provide birds with water from condensation, and gravel needed for digestion. Rooftops and warehouses provide excellent shelter for nesting. Birds are attracted to three things, food, shelter and water. Knowing what has drawn the pest birds to the area they are in will help determine the right product to get them to leave by making the area undesirable, or unusable. Once you have spotted a problem area it is important to identify the species of bird. This is important, because most bird deterrents are species specific. What works for the goose does not always work for the gander. Most pest birds are easily identifiable; common species include pigeons, sparrows, starlings and seagulls. If you are unsure of the type of bird, note the size. Size usually determines the type of product that will be effective. Next contact a provider of bird control products, or your pest control company. Both should be able to recommend the best solution. If your maintenance department does not have the time or resources to tackle the problem, such as lifts for high areas, then finding outside help is suggested. Most pest control companies will handle a pest bird problem, if you have a company who services your property, start by asking them. 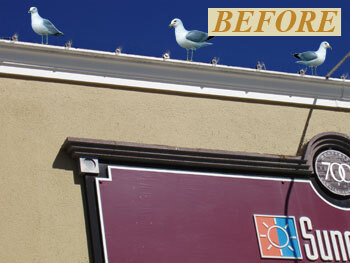 If not, contact bird control suppliers such as Bird-B-Gone who have a network of “Authorized installers” nationwide. There are many different products available to choose from. Once you have determined the problem area, and bird species, you will need to choose a product. If you have a pest control company taking care of the problem they will usually be able to give a free estimate, including a recommendation for the best product. If your maintenance department is handling the problem, a Bird Control Supplier, such as Bird-B-Gone, will be able to assist with choosing the right product. Call before hand and get an idea of pricing. Typically Bird Control is not included in maintenance budgets, so it’s a good idea to be prepared. It’s important to choose a product based on its effectiveness, not its price. Bird Spikes – Though they look menacing, spikes will not harm birds. 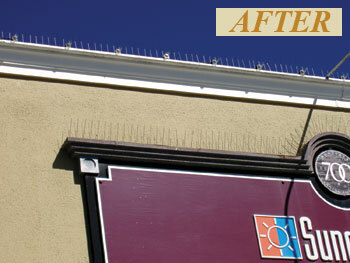 Bird spikes are used to deter pigeons or larger birds, who know they cannot get footing on such a surface. Spikes are easy to install, and require little to no maintenance. Spikes are commonly used on parapet walls, ledges, rooflines, signs, window sills, rafters, and other narrow surfaces birds may be landing. They are low cost, and can be mounted with nails, screws, or adhesive. Bird spikes do not need to be sharp to effectively repel birds, in fact if they are sharp they can pose a threat to the installer. Bird Gel – Bird gel is a very thick sticky gel that is applied on ledges and window sills. Birds do not like the sticky sensation on their feet, and will move on to a more comfortable area. However it should be noted that gels are a temporary solution and have a tendency to gather dirt and debris. Bird Netting – Bird netting acts as a physical barrier to exclude birds from open areas. Bird netting can also be used to box things in such as air conditioning units. Netting is typically used in warehouses, on rooftops, and in parking structures. Installation of netting is more labor intensive, but is one of the most successful products used to deter pest birds. Be sure that you get technical advice if installing net. Birds will take advantage of a poorly hung net. Shock Track Systems – Track systems are a ledge product. You use them wherever you might use bird spikes. The advantage to these electrified systems is that they are very low profile (Most stands under an inch tall) and will deter all species of birds. This is ideal if you are concerned about the aesthetics of a building, or are having problems with multiple bird species. The Electrified track emits a slight shock to birds that will condition them to stay clear of treated areas. Be sure to have an experienced authorized installer set up these systems. The installer will must have a working knowledge of electric bird deterrents. These four categories cover the main products used. There are other unique products for special circumstances. Consult Bird-B-Gone, or an authorized installer for advice. The more detail you have about the affected area, the more specific they can be when offering a solution. Companies like Bird-B-Gone have a network of authorized installers in all parts of the country. These installers are experienced in “bird work”, this is their specialty! 2. Determine whether your company is equipped to install bird control products, or if they need to seek outside help. 3. Call a reliable authority on bird control like Bird-B-Gone. (1-800-392-6915 ) and get advice. 4. Get educated on the products available. Have an installer give advice on the right products, or ask for a free estimate on service. 5. Make a commitment to solve the problem. Birds are a beautiful gift of Mother Nature. Throughout history they have been revered as signs of strength, good luck, beauty, and wisdom. Nature enhances our environment, and it’s important to find workable ways of living together in a healthy environment. We must live together, but that doesn’t mean living with disease. Joe Felegi, president of Critter Control of Florida, is always appreciative of the mutual referrals his six-office franchise has with several area pest management firms. But one recent referral in particular required his crew to become a bit creative. "A pest management firm referred us to a five-story building in Palm Beach County, on the island," Felegi explains. "The building’s residents were beginning to complain of mites, stemming from a major starling problem." The unusual architecture of the building provided i deal harborage for the population of European starlings: The tiny birds were roosting in the decorative wood soffits, and found the many knotholes to be quite cozy and protective. After assessing the situation, Felegi and his team decided to take an integrated approach, using two Bird-B-Gone products. The 3/4-in.-mesh Bird Net 2000 would be able to protect all of the detail work on the building, while the Bird Slope could protect the various ledges and beams. By joining several 2-ft. lengths of Bird Slope, the crew would be able to create almost a "sliding board" effect for birds trying to roost – they would not be able to gain a foothold on the 90-degree angled product, which is made out of non-conductive, sun- and weather –resistant PVC. Felegi presented the plan to the building’s owners, who also own several other, similarly constructed buildings in close proximity (in fact, the building itself houses only caretakers and other employees of the neighboring commercial properties). But they initially balked at the idea. “They didn’t want us to use net at first, because they were worried about aesthetics,” Felegi says. “But we put up a sample for them, and they realized they couldn’t see it from the street. The sample made the sale”. “In fact”, he adds with a laugh, “when we were done with the installation, they were complaining that they didn’t think we did anything, because they couldn’t see it!" The lack of starlings milling around, however, soon gave them their proof. Once the crew’s work was complete, Felegi contacted the PMP to green-light the mite treatment. Starting next summer, his crew will follow up on the account on an annual basis to ensure all the anchors are secure and to repair any tears in the mesh. At press time, Felegi is in negotiations to treat the clients’ other buildings nearby. "We had to educate the owners that this is an investment to their property, not just a short-term solution," he says. "They understand now that this adds value, and protects the building’s occupants." pigeon droppings: histoplasmosis, cryptococcosis, and psittacosis. off windowsills, will not result in high exposures. urban children have been exposed to Cryptococcosis. fatigue, fever, headache, rash, chills, and sometimes pneumonia. treated with a common antibiotic. Protecting the health of both workers who clean up pigeon droppings and the general public is important. coveralls, boots, gloves, and respirators can be used for protection. exposed skin before eating or drinking and when finished with work. installed to prevent further accumulation of droppings. BIRD•B•GONE KEEPS BIRDS OFF BRIDGES! Bird•B•Gone, Inc. Bird Control Products keep Pest Birds off of bridges nationwide. Bird•B•Gone, is the leading manufacturer of bird control products in the US. Their products humanly deter pest birds such as pigeons, seagulls and crows from buildings, structures, bridges, highway overpasses and other areas they like to nest and roost. Bruce Donoho owner of Bird•B•Gone, Inc. says bridges make a perfect nesting and roosting area for birds such as pigeons. They are protected here from interference by people, predators and the elements. The droppings left behind by these birds can erode building materials such as concrete and steel. When asked how to eliminate the birds from bridges and overpasses, Donoho says you must create a physical barrier that keeps the birds from landing. This can be done with bird spikes, bird netting or even shock systems. If the birds have nowhere to land, they will move on to another area. Danny Sicurella of Global Bird Management Corp. has used Bird•B•Gone products on many highway bridges throughout Illinois and Arkansas. The Illinois Department of Transportation contracted him to “Bird Proof” highway overpasses that where infested with pest birds such as pigeons and swallows. Danny says that in some cases the feces left behind by the pigeons was 3 – 4 feet deep on the concrete supports. The pigeon feces, over time, will erode the concrete and compromise the support. He used bird netting to secure the bridges from pigeons nesting and roosting. Danny says that protected birds such as swallows are also a big problem on highway overpasses. Once a protected bird takes up “home” on the bridge, it is illegal to do bridge maintenance until the bird has gone. This can really become a safety issue. Danny also used Bird•B•Gone Bird Netting to keep the swallows from making homes on these bridges. Rob Lang of Smithereen in Chicago has bird proofed 26 viaduct/overpasses in the last 3 years. 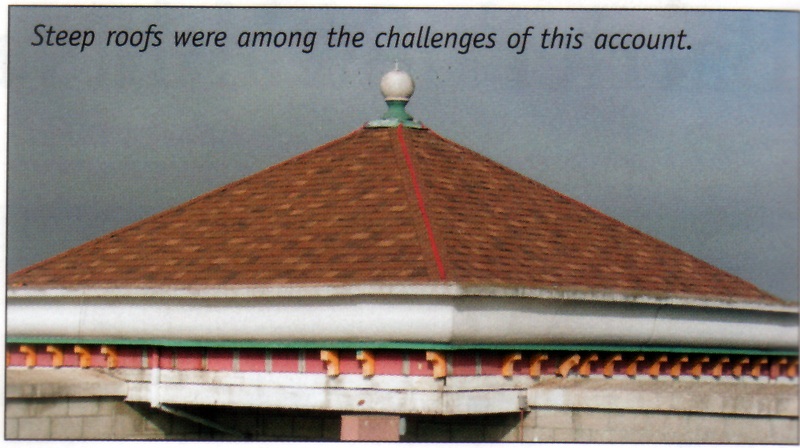 Lang states that most of the structures have had pigeons living on them for years. He says that the feces left behind is “deep and disgusting”! A large part of the project is cleaning and sanitizing the bridge before bird control products can be installed. Rob uses bird netting and bird spikes from Bird•B•Gone to keep pest pigeons from nesting and roosting on support beams. In Dallas Texas, Gulf States Bird Control, owned and operated by Brett Mayes, has been contacted frequently to provide bird control for bridges and overpasses. Brett says that he has put in many bids but has not done any jobs. He fears that cities and transit authorities still are not aware of the importance of bird proofing bridges, not just the health risk to maintenance workers, but the structural integrity of the structures themselves. Donoho also states that Bird•B•Gone products are keeping such bridges as the Golden Gate, Brooklyn Bridge and others bird free. Not only are we protecting the bridge infrastructure, we are also protecting the health of those who use the bridges daily. Bird-B-Gone, Inc. is located in Mission Viejo, CA can be contacted at 800-392-6915.